Hey everyone! How excited are you that it’s Halloween in just THREE days?! If you haven’t already noticed, I love Halloween! 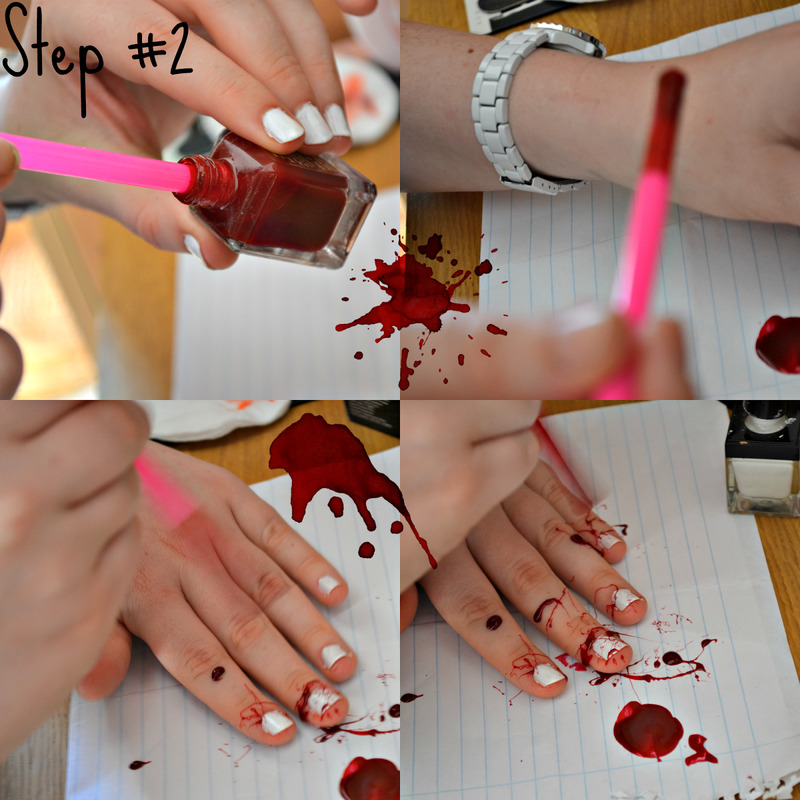 So I decided as part of “Halloween week” here on the blog, I thought i’d give you guys an awesome nail art tutorial, so here it is! If you’re like me and find it hard enough deciding what make up/hair/costume to wear on Halloween, nails just become a bit of chore don’t they? But here’s a super awesome way to do your nails for Halloween that will go with literally any costume, plus, it only takes five minutes! I hope you like it! So to start, you’ll need to prepare the surface that you’re working on as it’s going to get quite messy! I just used a piece of paper, but i’d suggest using something a bit more durable like an old cloth or something. 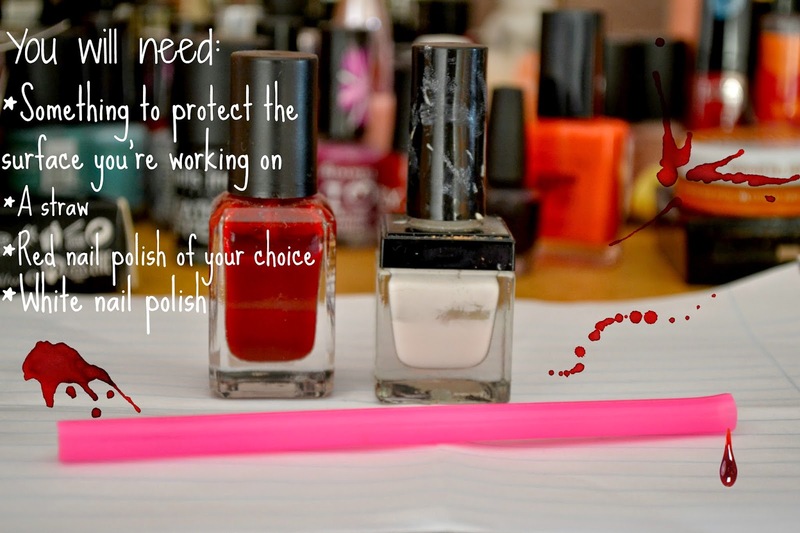 You’ll also need a straw, a red nail polish of your choice, I used Barry M’s “Red Wine” and a white nail polish of your choice, any odd one will do. I’ve had this one for ages, my old flat mate gave it to me, I don’t even know what make it is, but it did the job! 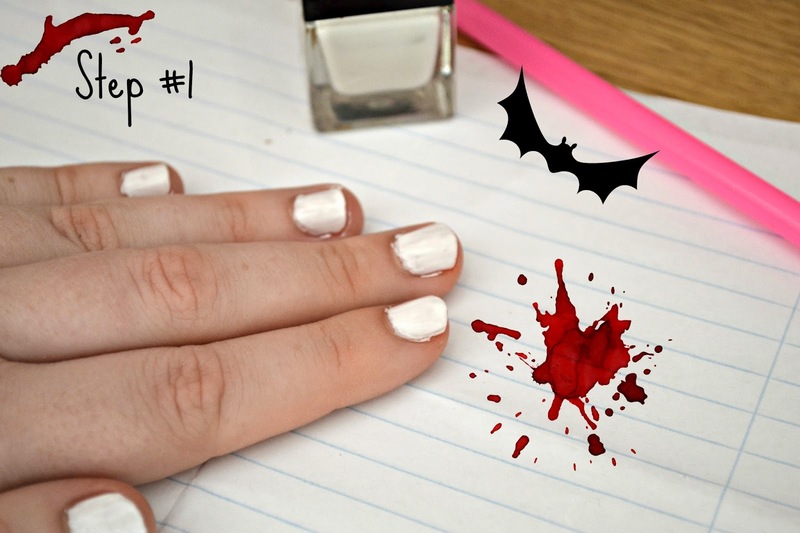 The first thing you’re going to have to do is paint all your nails white. You don’t need to be particularly neat right now as you’re going to have to clean up around the edges later anyway. Next is the fun part! So what you’re going to do is simply take your straw and pop it inside the red nail polish until it’s completely saturated with polish. Then, BLOW! From a distance of about 30cm, gently blow into the straw, towards your nails. I found that I got the best effect by sort of shaking my head in the process too! (innuendo’s galore..) PLEASE make sure you don’t breathe IN the nail polish! All that’s left to do now is clean up! Using cotton pads or buds soaked in acetone/nail polish remover, clean around the nail and on your fingers/hands(trust me, it gets everywhere! ), and viola! There you have it! 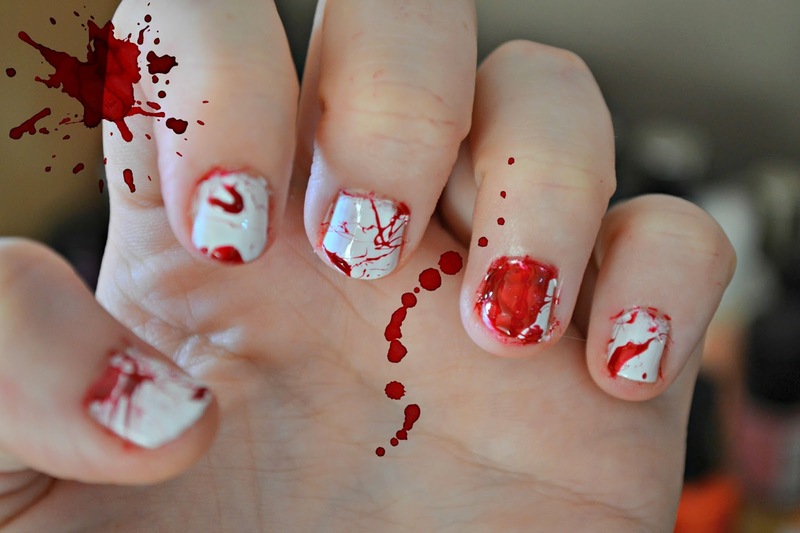 Your blood spattered nails! I’m sorry that this last photo is half blurry, I didn’t realise when I took them, oops! They’ll go with any Halloween costume! I really hope that has inspired/helped some of you! If you try this out, please send me photos on Twitter(@lovemaisieblog) or Instagram(@lovemaisieblog), I’d love to see them! So, if you haven’t already heard, I started my very own youtube channel! You can check out my first video here and make sure to subscribe as i’ve got an awesome Halloween video coming this Thursday, woop!